On Friday, the final six players of a 1,189-player field returned to battle down to a winner in the 2013 World Poker Tour Borgata Poker Open. 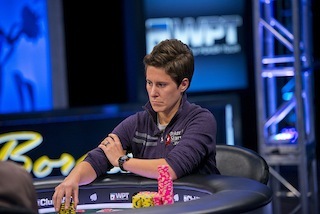 It took nearly eight levels of play, but eventually 32-year-old Anthony Zinno, a poker pro from Cranston, Rhode Island, defeated Team PokerStars Pro Vanessa Selbst in heads-up play to win the $825,099 first-place prize, a $25,000 seat in the WPT Championship, and etch his name on the WPT Champions Cup. According to the WPT live blog, action resumed in Level 31 with the blinds at 50,000/100,000/10,000. The first elimination of the day happened on Hand #15 of the final table and began when Jeremy Kottler min-raised to 200,000 from the button. Cong Pham called from the small blind, and then the short-stacked Eric Fields moved all in from the big for 1.685 million. Kottler thought for a minute before making the call only to muck when Pham moved all in over the top. Kottler then folded. It was a classic flip, and according to the PokerNews Odds Calculator, Fields had a 56.20% chance of surviving the hand while Pham would win 43.31% of the time. The flop failed to help Pham and his chances of winning dropped to 26.77% while Fields’ jumped to 71.72%. The turn actually bumped Pham’s chances up to 29.55% with the added flush draw, but it’d be the non-diamond on the river that gave him the win. Fields, a 22-year-old poker pro from Greensboro, North Carolina, exited in sixth place and took home $168,610 for his efforts. Not a bad payday for the man who graduated from the University of Alabama back in May with a degree in Business Management. On Hand #44, which took place in Level 32 (60,000/120,000/20,000), 26-year-old poker pro David Randall raised to 300,000 from the small blind only to have Kottler three-bet all in. Randall called off for 3.15 million and was in good shape as his was out in front of Kottler’s . Unfortunately for him, he wasn’t rewarded for his good call as the flop gave Kottler a pair of aces. Neither the turn nor river helped Randall, the boyfriend of Christina Lindley, and he hit the rail in fifth place for $208,394. Four-handed play was an extended affair, and Selbst used it to her skillful play to go from the short stack to second in chips. On Hand #84 (Level 32: 100,000/200,000/30,000), action folded to Selbst in the small blind and she moved all in to put the pressure on Kottler in the big blind. 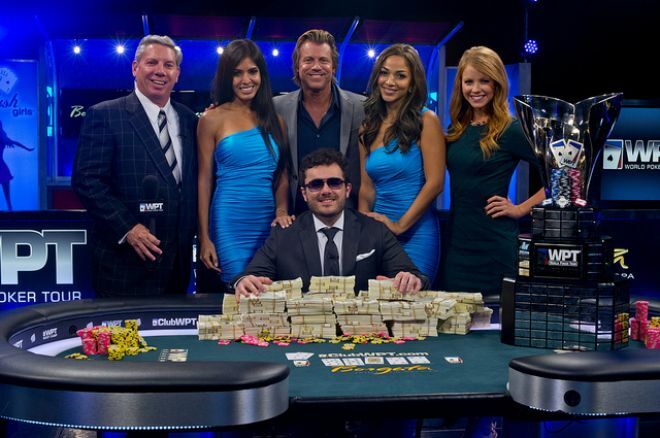 The 33-year-old poker pro from Cleveland, Ohio called off for 2.71 million and it was off to the races. Kottler got it in good, but considering he found an ace against Randall, it only seemed fitting that Selbst did the same on the flop. The turn gave Selbst trips, which meant Kottler needed a red five on the river to stay alive. 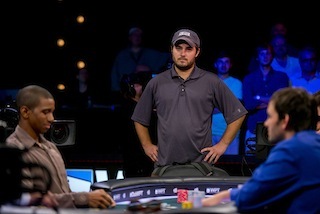 The dealer burned and put out the , the last card Kottler would see before taking his leave in fourth place for $251,968. During three-handed play, Zinno managed to double through Selbst on Hand #96 and captured 55 percent of the chips in play. Not to be outdone, Selbst doubled back on Hand #107 and essentially swapped positions. All the while, start-of-the-day chip leader Pham, a 29-year-old from Naples, Florida, waited patiently. Eventually he picked a spot in Level 35 (120,000/240,000/40,000) on Hand #111. It happened when Zinno opened for 500,000 from the button and Pham, who is married with a child, three-bet to 1.3 million from the big blind. Zinno ended up four-betting and then called when Pham shoved for 8.125 million. Pham tabled the , but it was dominated by the of Zinno. The flop paired Zinno’s king and left Pham drawing to running cards. The turn took away any chance of that happening, and the river officially eliminated Pham in third place for $301,225. Heads-up play began with Selbst holding a slight lead over Zinno, and over the next 20 hands or so she pulled out to a more than 2-1 lead. In Level 37 (200,000/400,000/50,000) on Hand #134, Selbst min-raised to 800,000 and then moved all in when Zinno three-bet to 2.1 million. Zinno tanked for a minute and then called off for 11.3 million with the . Selbst rolled over the . The board ran out and suddenly Zinno was in the lead. Nine hands later, which was the first hand in Level 28 (250,000/500,000/50,000), Zinno opened for 1.2 million and then called when Selbst moved all in for 7.775 million. Selbst was behind and in need of some help, but she would be left wanting as the board ran out . Selbst, who just missed out on becoming the first woman to win an open buy-in WPT event, finished as runner-up for $492,569 while Zinno, who graduated from WPI with a degree in chemical engineering, claimed victory and the $825,099 first-place prize. Data and photo courtesy of WorldPokerTour.com.